I’ve been lucky for the second year in row to go at MIX. I was very excited to be part of the event, because one of the main topic was about Windows Phone 7. I’m a long time fan of Windows Mobile. I often think about building some Windows Mobile application, but i had to learn the .NET Compact Framework. But i didn’t had much time to learn that framework. Since I'm focusing my development skill on Silverlight, the announcement of Windows Phone was a great relief. My installation and testing the new tools was very easy. I’m looking forward to develop some application using Silverlight on Windows Phone. So look often at this blog because i will post often about Windows Phone. Globally MIX10 was not as surprising as last year because most of the announcement was not exclusive. We knew most of the announcement prior to the MIX. But i can easily tell, this was my preferred MIX at this time. Because, i took advantage of the event in many ways. I’ve learned a lot from the session which where very good. Also i had a good time meeting a lot of people, from which i learned a lot. Here is some links for resources related to MIX and to Windows Phone. Two week ago i presented a session on Expression Blend for developers. I had a great time presenting (even if i had some issues remembering my slides). But what was interesting wasn’t the slides but the demos. So today i will show you some tips and tricks based on my demos. Using gradient can help improve the visual aspect of an application. In Expression Blend the functionality is well implemented. First select the control you want to apply the gradient. In the Properties bar you can select on which properties you want to apply the gradient. More often we apply the gradient on the background of an object. Now you can select the third option. This is the gradient tools. The gradient slider allow you to change the way the gradient will look like. Here is an example of the way we can use the slider to create some effect. For each anchor we can change the color and the opacity. Also there is a tool in the toolbar that allow us to change the direction of the gradient. This tool display an arrow that let you change the direction of the gradient. It’s really simple to use. So we can have professional background for our application by setting the gradient from “Black” to “Almost Black”. And use the Gradient Arrow to change the gradient direction. 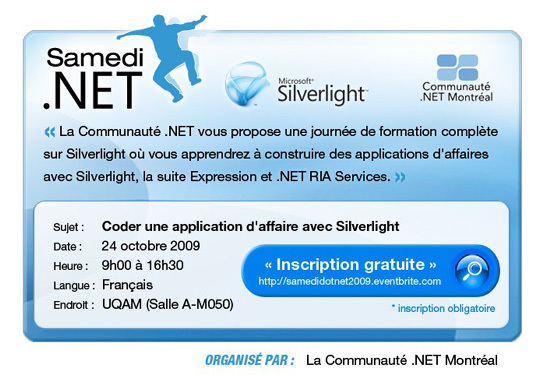 This Saturday the .NET Montreal User Group presented a full day of presentation on Silverlight. The main topic of the day was “How to build a business application with Silverlight”. There was more people than we expect to have on a Saturday (more than 160 persons). Five speakers shared the stage to cover the whole presentation(Laurent Duveau, Dominic Sévigny, Guy Barrette, Pascal Groulx and me [Louis-Philippe Pinsonneault]. The real goal behind this day was to present the different tools that a developer may have to use to create a business application. There is effectively a real interest in Silverlight in the community. It was interesting to see that there was not only developers but also some designers who attend at the day. I’m really happy to be part of this event and sharing with others. If you are interested in taking some Silverlight training, look at the Silverlight Tour. Also you can attend at the Tech Day on December 2nd to December 4th at Montreal. I will present a session on Expression Blend. Dominic Sévigny will present a session on PRISM and Laurent Duveau will present the new feature of Silverlight 3. The crowd before a few minutes before the presentation. Guy Barrette talking to Christian Beauclair (from Microsoft) just before the presentation. Guy building a Silverlight SketchFlow application and integrate a sample data source in his sketch flow application. An overview of the crowd. Laurent answering some questions while Pascal Groulx prepare his presentation. Pascal a few moment just before his 1st presentation. His presentation focus on how to build a web service using WCF. Dominic Sévigny show us how to work with Styles in Silverlight using Visual Studio and Blend. This is me explaining how to build custom controls in Blend. I create a button based on a rectangle, and i tried to make it shiny. The second presentation of Guy was about Expression Designer and Expression Blend. He show us own we can integrate file made with Adobe Illustrator or Adobe Photoshop. Dominic came to help Guy to integrate the user control containing a logo. Dominic show us how to create animation using Expression Blend. Laurent finish the day by presenting how to work with SEO. Finally, Laurent answers some questions at the end of his session. Since a couple of week i was looking for way to create reports within Silverlight or generate printable version of the content of the Silverlight application. I found some solutions (with the help of Dominic Sévigny). As a reminder, Silverlight doesn't allow us to access resources from the client machine for security reason. This is why it's not possible to print within Silverlight. As you will see, all of the controls I'll talk about use a similar technique to generate reports. They generate files like PDF, Excel, ... as container for the report which allow you to save the file locally or open it with your local viewer or editor which allow you to print the file. To generate reports there is Perpetuum Software who have a reporting tools that allow you to generate the report on the server and a report viewer for Silverlight that allow you to view and export (PDF, XLS, DOC) reports. 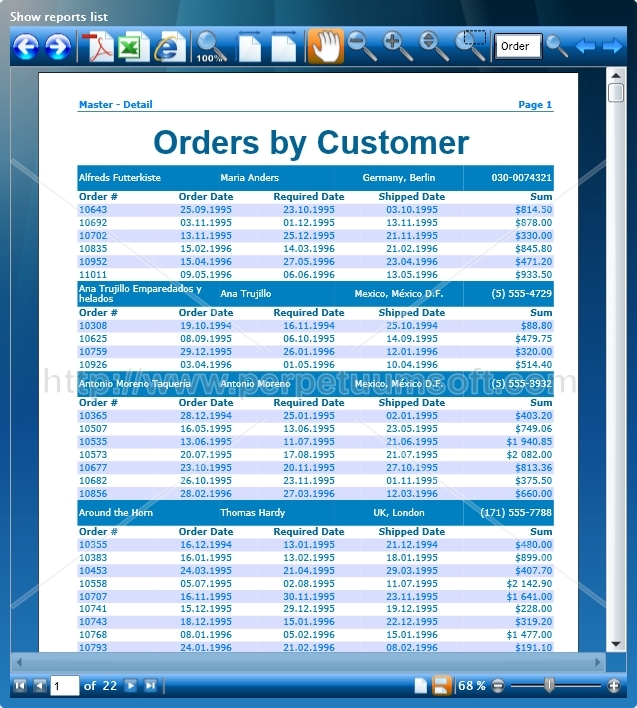 To generate a printable version of the content of a Silverlight application, there is a beta software called SmartPrint for Silverlight from SmartWebControls. This application let you generate a PDF. This is a workaround solution when you need to print, because Silvelight doesn't allow us to access to do. This control take the XAML part to render in the PDF and send it to an HTTPHandler on the server. This HTTPHandler use server side component to render the PDF and return the result PDF to the client. Those solution are good workaround for the security limitation of Silvelight. I hope in the next version of Silvelight they will integrate some native feature for printing and/or reporting. Seadragon - Seadragon enables you to pan, zoom, and make an image full screen. You can use it, for example, to display interactive product pictures. AsyncFileUpload - This new control enables you to perform file uploads without doing a postback. The control displays a throbber image during upload and raises client and server events when the upload is complete. This control was contributed by Steven Lindsay. Finally the have implement the File Upload functionality. Like many people this was my long awaited feature. On October 24th, there will be a special training event on Silverlight. I’m very please to be part of the event as a presenter. My presentation will focus on Expression Blend. Feel free to register by clicking on the image below. This morning while i was reading my RSS feed, i seen something interesting for anyone who want to start developing in Silverlight or WPF. Microsoft Learning have just released a new course "Introduction to XAML" which is free. Today is a big day for Silverlight. I will post more on the new feature very soon. Save the date: Microsoft TechDays Canada will have its second edition in 2009 and is coming back to Montreal on December 2, 3.